OH Valentine's Day. How I love (and DON'T love) thee! I try not to make too much fuss about "holidays" like Valentine's Day. There's enough pressure in day to day living! However, I DO want to have a little fun and make sure my kids do too. 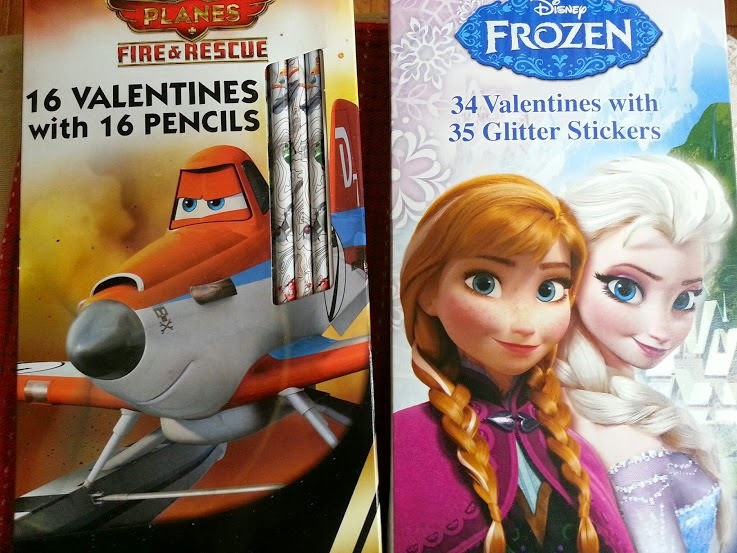 So far, we bought good-old valentines for the kiddos to give out at their school. Simple, cheap, cute AND they include NON-FOOD "treats" like pencils and stickers. 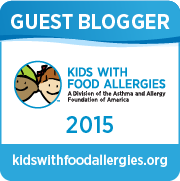 Valentine's Day is such a candy and treat-focused time which makes it challenging for kids with food allergies. Non-food treats are an awesome way to celebrate the day and still show friends you care. Aww. Oh, and parents of kids with food allergies REALLY appreciate those non food treats too. On the other hand, it's also fun to have food allergy-friendly recipes and ideas in your back pocket for days like this. 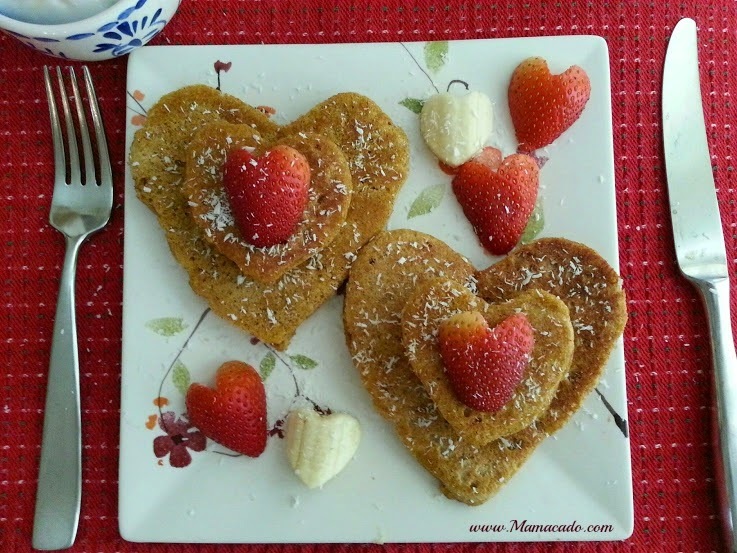 I have a set of heart shaped cookie cutters like these (affiliate) that I'll use on Valentine's day to have fun with sandwiches, fruit, cheese, etc, etc!). We're also going to have our favorite Vegan Pumpkin pancakes to start the day with a special treat. I already cooked and froze them ahead of time so I can just pull them out of the freezer on Vday. It's so easy to make this beautiful plate. Just cut a triangle out of the top of halved strawberries, and sprinkle shredded coconut and dairy-free chocolate chips and enjoy! 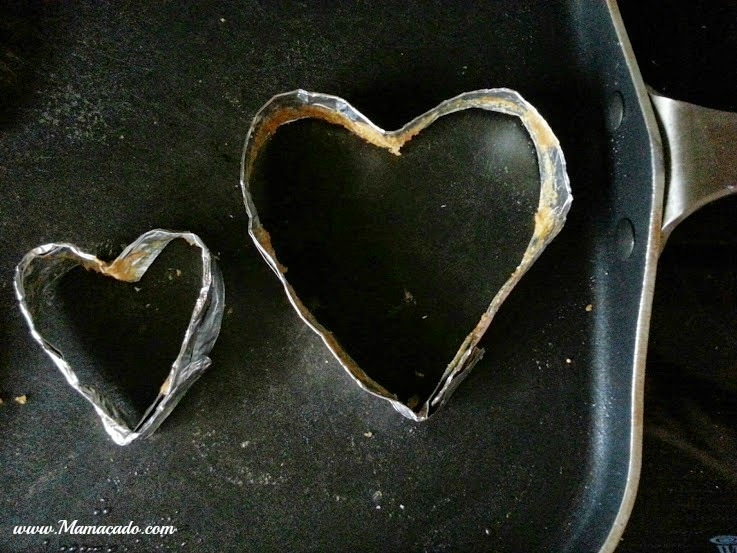 I used this tin foil mold idea to make heart shaped molds for the pancakes. It was simple and easy to make and it took about 5 minutes total! Basically, just fold a long piece of tinfoil the "hotdog" or long way, and wrap it around a heart shaped cookie cutter. Take out the cookie cutter from the foil, and adjust the tinfoil as needed to make a more perfect heart. Spray the inside of the tinfoil with oil of your choice. I used olive oil in my Misto Sprayer (affiliate). 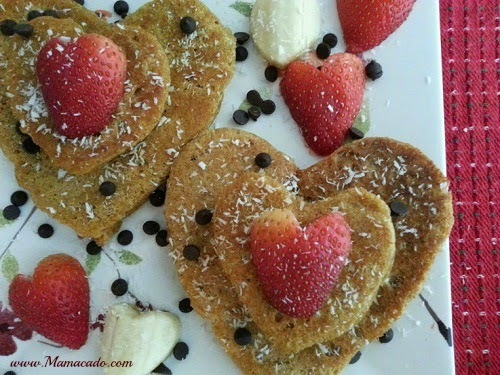 Put the tinfoil heart mold on an already heated pan and pour in your pancake batter. Once the pancake is done on one side, carefully peel off the tinfoil and flip the pancake as usual to finish cooking. This photo is about 2 pancakes later. The molds are still ready to shape a pancake! Don't plan on making 20 pancakes with this tinfoil mold unless you have lots of time. I successfully used each one for about 3 pancakes (and made the rest of my pancakes the traditional way!). After each pancake I wiped off some of the pancake batter that stuck onto the tinfoil mold. Make sure to spray the inside of the mold every time before you use it so the batter doesn't stick. How do you celebrate Valentine's Day? 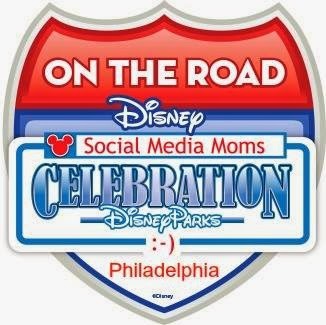 There are SO many creative ideas out there (on Pinterest for instance!). 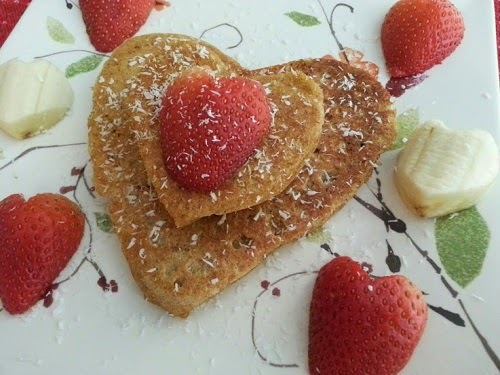 Are you able to share the pancake recipe?